Promotions on Hold (POH) is customized audio programming for callers waiting on hold. It includes professionally recorded messages mixed with fully-licensed music to keep callers entertained & informed until your company’s representative can attend to them. The messages your callers hear while on-hold allows them to become educated about the various services you offer. Nextcom has a strategic partnership with Illinois Audio Production, which has more than ten years experience in the POH industry. In addition, they have thirty years of marketing and broadcast experience. Professionally written scripts customized to your business. Licensed music from a vast library. An average 24 to 48 hour production turn around time after script approval. IAP keeps a master audio file of all our productions in the event yours is lost or damaged. Each and every script IAP writes is customized for your particular business. There are no fill-in-the-blank or “canned” scripts. IAP obtains the needed information about your business and expand on your ideas to create informative messages. You approve all scripts, music, and voices before the production starts. This way you know exactly how the production will sound. Presenting a positive image to callers is vital. This is why IAP uses state-of-the art digital equipment in their own on-site studios. This is also why IAP uses only experienced voice professionals who have the flexibility to meet your most demanding requests. A “Holiday Production” is a great way to send holiday greetings with seasonal music to all of your callers. Whether it be Easter, Thanksgiving, or Christmas, you can give a fresh touch to your On-Hold messages. Whether it be a radio commercial or a fun on-hold program, IAP can add reverb, echoes, voice bends, and other specials effects to make your production stand out. Ask for details! IAP’s “On-Hold Service” provides everything you need to inform and entertain your callers. In fact, about the only things you are required to do are to approve the scripts and choose the voice and music you want on your production. Radio station playing music, negative news items, or even a competitor’s commercial. On-hold messages that offer useful information about the company one is calling. 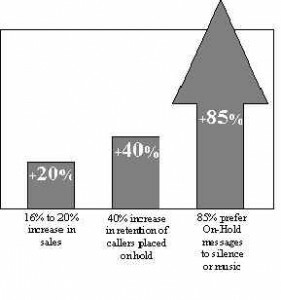 A recent independent survey stated that 88% of callers preferred on-hold messages to the other two options. The information they heard on-hold was educational and valuable. 14 to 20% of the callers who listened to on-hold messages made a purchase or decision based directly on the information they heard. Customized on-hold messages are becoming a powerful marketing tool. Promote specials and seasonal events. Introduce new products, services, and promotions. Turn negative time into positive time by informing, educating and motivating your callers. There’s always something new or different to tell your callers. On-Hold messages offer a professional marketing touch that motivates current and potential customers to buy from you. We contacted several companies that are currently using telephone on-hold messages. . .
Jim Bartoli of Cellular Dimensions, an agent for Cellular One services, stated that several of his callers have told his staff, “Put me back on hold, I want to hear the rest of the message. We have definitely increased our sales with telephone on-hold messages,” he added. I discovered that companies large and small, such as AT&T, MTA Trucking Schools, Motorola, Cellular One, H&R Block, and Xerox are all enjoying positive results with on-hold telephone messages. Nextcom’s POH is a turn-key solution for productively using waiting time over your telephone system. For many companies, the telephone is the first point of contact with potential customers. POH allows you to control that first impression. Reduce caller frustration & abandonment. 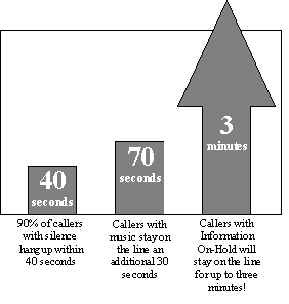 Invite callers to stay on line for personal attention. Inform callers about your company’s products & services. Reflect professional customer service image. Increase sales of products & services. Replace ‘dead air’ or your competition’s radio commercial. Prevent infringement of federal copyright laws. We provide our customers with state of the art Premier Technology Incorporated systems and a wide selection of computer based POH solutions.